Nikola Jokic had a triple-double with 23 points, 15 assists and 11 rebounds and made three free throws in the final seconds as the visiting Denver Nuggets ended the Toronto Raptors' eight-game winning streak with a 106-103 win Monday night. Jokic made a free throw with seven seconds remaining to end a tie and made two more with 5.6 seconds left for the final margin, extending Denver's winning streak to six games. 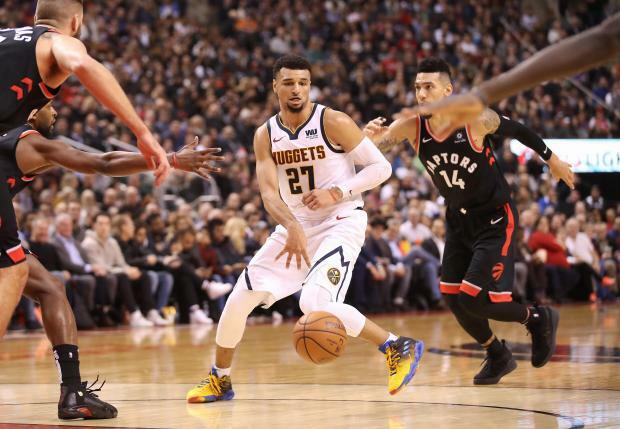 Jamal Murray added 21 points for the Nuggets, and Juan Hernangomez and Malik Beasley had 15 each. Kawhi Leonard led Toronto with 27 points and had eight rebounds. Serge Ibaka added 15 points. Golden State's Big Three combined for 85 points, and the Warriors broke their two-game losing streak with a win at Atlanta. Stephen Curry scored 30, followed by Kevin Duran (28) and Klay Thompson (27) as Golden State improved to 5-7 on the road. Curry, playing in his second game since missing 11 games with an ankle injury, made six 3-pointers. Atlanta lost its third straight game despite getting 24 points and 11 rebounds from John Collins and 20 points from rookie Trae Young. Alec Burks threw down a tiebreaking slam dunk with 3.2 seconds remaining, and Cleveland escaped with a victory over Brooklyn. The Nets saw their home losing streak reach seven games. Burks finished with 13 points in his third game for Cleveland after being acquired from Utah on Thursday. He helped end the Cavaliers' losing streak at four games. The Nets had one more chance to tie or win, but Spencer Dinwiddie's 3-point try was well short of the rim with 1.5 seconds remaining. Jordan Clarkson led the Cavaliers with 20 points and a career-high 11 rebounds. Brooklyn's D'Angelo Russell led all scorers with 30 points but shot 13 of 31 as the Nets' overall losing streak reached seven games. Bradley Beal scored 27 points, Kelly Oubre Jr. added 21, and Washington held on to win at New York. John Wall had 18 points and 15 assists, Markieff Morris scored 18, and Otto Porter Jr. contributed 15 as Washington won its ninth straight game at Madison Square Garden. Emmanuel Mudiay's two free throws got the Knicks within five with 1:02 remaining, and after Morris missed a 3-point attempt, Noah Vonleh's layup cut the Wizards' lead to three. However, Wall's 3-pointer with 12 seconds left made it 110-104. Tim Hardaway Jr. led five New York players in double figures with 20 points. Steven Adams had 21 points and six rebounds in 27 minutes, and visiting Oklahoma City snapped Detroit's five-game winning streak. Russell Westbrook contributed 18 points, six rebounds and six assists for the Thunder, who have gone 15-3 since an 0-4 start. Paul George supplied 17 points and 10 rebounds. Detroit's Blake Griffin had 20 points, five rebounds and four assists but went 7-for-18 from the field. Pistons guard Reggie Bullock sustained a left ankle sprain in the early going and did not return. Tobias Harris scored 27 points and Danilo Gallinari added 24 as Los Angeles won at New Orleans. Lou Williams came off the bench to add 20, Avery Bradley scored 15 and Montrezl Harrell had 14 for the Clippers. Julius Randle scored a career-high 37 to lead New Orleans before fouling out with 4:04 remaining. Jrue Holiday added 32 points and 14 assists, Anthony Davis had 23 points and 13 rebounds and Darius Miller scored 15. Karl-Anthony Towns recorded 24 points, 11 rebounds and three steals to help Minnesota recover from a 19-point, first-half deficit to post a victory over Houston in Minneapolis. Andrew Wiggins scored 16 points for Minnesota, which won for the fifth time in the past six games. Taj Gibson added 15 points and 11 rebounds. James Harden had 29 points and eight assists for Houston, which tallied just nine fourth-quarter points while falling for the fifth time in its past seven games. Clint Capela scored 24 points for the Rockets.